The brainchild of Area Four’s Michael Krupp, this geek speakeasy offers an unrivaled retro gaming experience, with options ranging from Tetris to Tekken. But the nostalgia-fest offers one major advantage over the gamer haunts of yesteryear: a killer cocktail program. Don’t be fooled by the cutesy flourishes—sure, you might be sipping your drink out of a giant novelty Tardis, but there’s pro-level mixology at work here. What you’re drinking: Princess Peach’s Downfall—a potent blend of Rumson’s 5-year rum, peach, pineapple, mint, and citrus—may not help your joystick skills, but it’s certainly a fun ride. 292 Massachusetts Ave., Central Square, Cambridge, 617-714-3960, a4cade.com. In 2016, B-Side Lounge veteran Dave Cagle embarked on a mission to give Kendall Square the ultimate neighborhood hangout. One wood-paneled watering hole later, and it’s clear he’s succeeded, with afterwork crowds flocking to those cozy booths for nights of deep conversation and drunken Jenga. Few bars clinch the highbrow-lowbrow vibe as deftly as the Automatic, where Mudslides share menu space with Vieux Carrés and Aviations. Snacks include fancy imported cheese paired with Ritz crackers. Watch out for the diabolically spicy Frito pie, courtesy of co-owner Chris Schlesinger (of East Coast Grill’s “Hell Night” fame). Need to cut the capsaicin? That frozen Mudslide just keeps looking better and better. What you’re drinking: Something straightforward with a spin, such as the Double Wide—a tasty, rye-whiskey-and-cola-syrup-spiked riff on a Jack and Coke. 50 Hampshire St., Kendall Square, Cambridge, 617-714-5226, theautomaticbar.com. If you have only one night to impress a cocktail-aficionado friend from out of town, and only one bar to take them to, Backbar is your destination—but first you’ll have to find it. Concealed behind a nearly unmarked door, this place feels conspiratorial in the way that the best bars do. You needn’t be a cocktail nerd to appreciate the drinks general manager Sam Treadway and crew are putting out—whether it’s a milk punch, a sherry-forward recipe, or something as obscure as Mexican sotol—but if you are, there are few places you’ll feel more at home. What you’re drinking: Whatever the Drink of the Week is. Trust them. 7 Sanborn Court, Union Square, Somerville, 617-718-0249, backbarunion.com. Never mind that it’s in Woburn. For years, the Sichuan Garden II’s Baldwin Bar has been hailed as the best cocktail spot in the Boston area, thanks to the expert mixology of bar manager (and the restaurant owners’ son) Ran Duan. And in 2015, the addition of a handsome library lounge upstairs made it even more of an Uber-worthy destination. The drink lineup offers plenty of steampunk whimsy—from a flask served in a cigar box to a beaker billowing with dry ice. Not up for the trek out of town? You’re in luck: Duan’s newer Blossom Bar, in Brookline, is within T-riding distance. What you’re drinking: A seasonally accented sherry cobbler, available only on the upstairs bar menu. 2 Alfred St., Woburn, 781-935-8488, thebaldwinbar.com. This Dot. Ave. pub is not only a second living room for much of Dorchester, but the official meeting place for Boston’s U.S. soccer supporters and several groups of English Premier League fans. Your match will be on whether you’re looking for the Celtics or Celtic FC; the Banshee has the NFL’s Sunday Ticket and all the Gaelic games. It’s a true sports bar, one that even opens early—with a breakfast menu—for some European matchups. What you’re drinking: Tom Crean’s or Guinness keeps things sessionable for the whole game. 934 Dorchester Ave., JFK/UMass, Dorchester, 617-436-9747, bansheeboston.com. The only thing better than a glass of grower Champagne? Sipping it alongside a platter of buck-a-shuck oysters and impossibly crispy buttermilk-ranch-dipped fried chicken. Such is the fare on offer at this laid-back Inman spot, which combines a carefully curated Old World-leaning wine program—and as of early 2019, a full liquor license and cocktail list—with some seriously good small plates by chef Alex Saenz. Head to the intimate wood-paneled bar at the back of the restaurant to discover your new favorite Barolo, Bourgogne, or vermentino—all available in half- and full pours. What you’re drinking: A Roussillon red, such as the 20-year-aged Mas Amiel Maury. 1071 Cambridge St., Inman Square, Cambridge, 617-714-3693, bisqcambridge.com. Here’s your ticket into Fenway—for the cost of a beer. A relatively nondescript entrance on the side of the park leads below the bleachers to a pub-like watering hole offering a close-up view of the field from behind a garage-door-esque retractable window. And even if there’s no game on, you can still get your drink on: Whether you’re in the mood to toast the team or drown your postseason sorrows, the bar is open year-round. What you’re drinking: Something to show your Boston pride, like a Sam seasonal or Harpoon IPA. 82A Lansdowne St., Fenway/Kenmore, Boston, 617-262-2424, bleacherbarboston.com. The Behan’s namesake is among Ireland’s greatest writers, and this bar is among Boston’s greatest pubs. It’s dark, it’s cozy, and the beer options are surprisingly stellar: The draft list is stacked with Mystic saisons, Castle Island IPAs, and Hermit Thrush sours, not to mention imports such as this winter’s fresh keg of the beloved Samuel Smith oatmeal stout. Of course, the cash-only bar can pour more than just pints—may we suggest a warming hot toddy? Add that to one of their weekly Irish music sessions, and there’s nowhere we’d rather hole up on a cold, snowy Saturday evening. What you’re drinking: A New England-made draft, such as Lawson’s Finest Liquids Sip of Sunshine IPA. 378 Centre St., Hyde Square, Jamaica Plain, 617-522-5386, brendanbehanpub.com. Whether the draw was the menu’s charred-and-chewy wood-fired pizza and charcuterie plates, the patio with the unbeatable view of the Bunker Hill Monument, or co-owner Michael Cooney’s draft lineup and deep beer cellar, you’ve made the right choice to pull up a stool here. But don’t sleep on the curated wines and ciders—or that patio. In the summer months, a lean Austrian Grüner or a sparkling Eden Cider from Vermont pairs perfectly with an outdoor seat. In winter? Stay warm with a half-carafe of spicy Rioja, best enjoyed by the hearth inside. What you’re drinking: This is a neighborly sort of place, with a neighborly sort of beer list—so opt for local pours from the likes of Jack’s Abby or Idle Hands. But with the likes of Tulsa’s Prairie Artisan Ales on draft and vintage Orval on the bottle list, it’s also a fine choice to roam further afield. Here, cocktail geeks and Central Square hipsters alike jostle for space at the brilliant metallic horseshoe bar that almost glows in the low light. Drinks range from the fun and social, like the infamous Daiquiri Time Out (a quartet of bar-industry-favorite shots), to such thoughtful but quaffable recipes as the White Mercedes Coupe (lemongrass-infused gin with coconut, lemon, and absinthe). Frequently rocking well-chosen vinyl on the record player, this is the type of cool-kids spot you’d dream about opening yourself if it didn’t already exist. What you’re drinking: The Naked Lunch, made with mezcal, Lillet, yellow chartreuse, grapefruit, and tiki bitters. 567 Massachusetts Ave., Central Square, Cambridge, 617-491-0016, brickmortarltd.com. At many of the increasingly homogenous new bars in Boston, the idea seems to be to flatten out the guest experience for a generic caricature of a “foodie” (charcuterie boards and Negronis for everyone!). But at a landmark like Charlie’s, the vibe is the exact opposite, with a full spectrum of drinkers having wildly different nights all at once. You’ll find grizzled old locals in the diner-like dive downstairs, sweaty punks rocking out upstairs, and Harvard students and faculty sipping brews in the outdoor beer garden. In other words, this dive is never going to change for you, and you don’t have to change for it, either. What you’re drinking: A shot and a can. Or, if you insist, a Boulevard Tank 7 farmhouse ale in the garden. The term “Southie”—like “millennial” or “hipster”—is one whose meaning changes depending on who’s saying it. While there may not ever be a consensus about what constitutes authenticity anymore, Whitey’s is about as close to classic Southie as you’ll find. Bottom line, this is a no-frills neighborhood bar. You will play darts or shoot pool here. You will drink non-fussy drinks, and you will meet people you didn’t come with. If you need something fancier than that, New Southie up the block has you covered. What you’re drinking: A shot of something cheap and stiff. 268 W. Broadway, South Boston, 617-606-5971, crokeparkwhiteys.com. Once upon a time, a night out in Allston meant getting blotto on Smirnoff Ice and Jägerbombs. But in 2007, Max Toste and Aaron Sanders upped the ante for the lovably lowbrow student haven with the launch of this upscale watering hole. 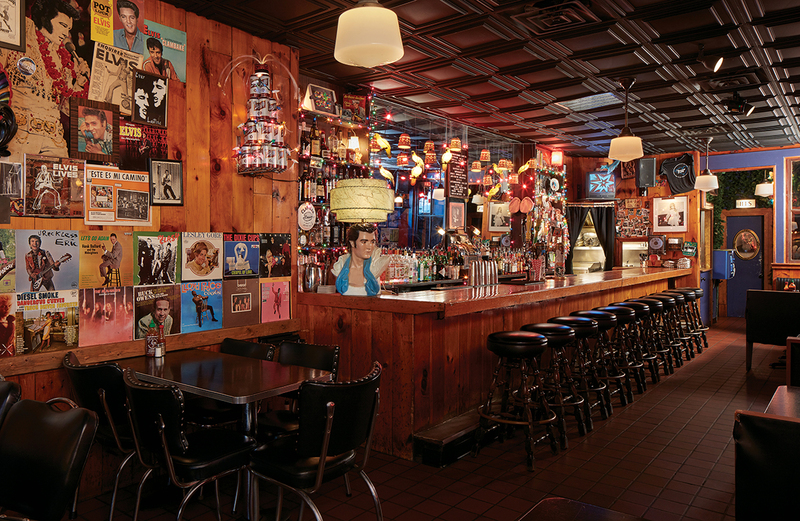 Channeling the southwestern swagger of Dallas’s vibrant Deep Ellum neighborhood, this now-essential Allston spot serves up some serious food and drink, without taking itself too seriously (see also: the “Lone Star Happy Meal”—a shot of tequila, a Tecate, and a side of sangrita). Here, the drafts skew sessionable and thirst-quenching; and the cocktails, classic. What you’re drinking: An aromatic German helles lager, or a Sazerac with a Topo Chico chaser. 477 Cambridge St., Allston, 617-787-2337, deepellum-boston.com. Sitting at the bar at Delux can feel like drinking in a fading snapshot of Christmas 1974. The glow of colored Christmas lights, the havoc of art and vinyl covers crowding the walls, and the shotgun closeness create a cheery warmth. Like any good dive, it offers a house combo—a Narragansett tallboy and a mystery shot (definitely Dr. McGillicuddy on our recent visit) for $8—but between the good beers on tap, truly tasty food, and bartenders who can make a mean cocktail, it’s more like a distressed jean jacket from Urban Outfitters than a Salvation Army find. 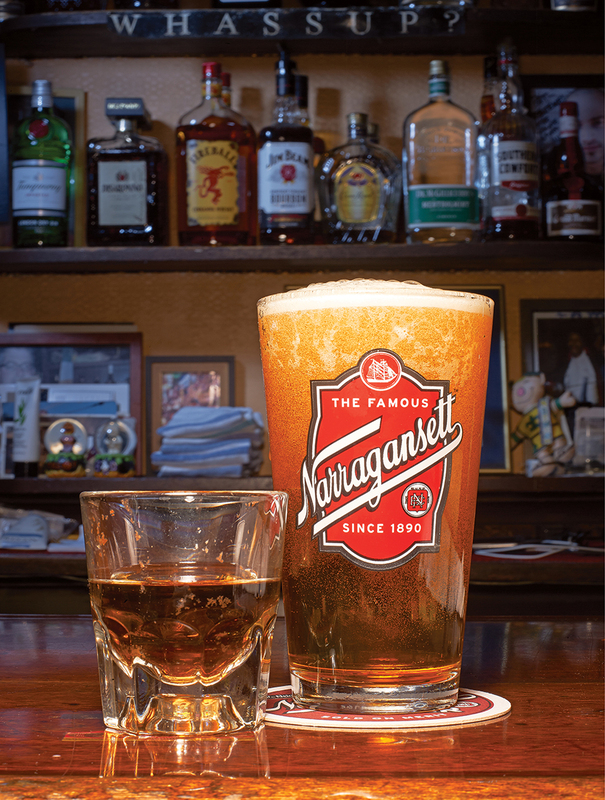 What you’re drinking: The Clam Slam combo: a ’Gansett tallboy plus a mystery shot, because we could all use a little more mystery, right? 100 Chandler St., South End, Boston, 617-338-5258. Aside from the Freedom Trail, the path to this historical J.P. bar may be the most traveled route in Boston. That’s thanks largely to the Samuel Adams trolley, which shuttles tourists from the brewery to the door of Doyle’s, the first place ever to serve Boston Lager. But Doyle’s hospitality, corned beef specials, and late-night pizza have also lured locals—including a number of politicians whose portraits adorn the walls—for more than 135 years. The landmark has added a couple of function rooms over the decades, but one look at the barstools full of regulars will tell you the place stays true to its roots. What you’re drinking: The latest from Sam Adams, of course. Back in the day before muddled herbs, fresh-squeezed juices, and custom ice cubes were de rigueur on drink menus, Barbara Lynch led the way by opening this cool, culinary-minded cocktail bar in Fort Point. Some 10 years later, crowds still pack the intimate space every night—and it’s easy to see why: Drink’s no-menu approach remains as novel as it was back in 2008, and it’s still one of the best places in town to order a tipple that’s just a shade out of your comfort zone. What you’re drinking: The possibilities are endless, but we always go back to the Prohibition-era libations (think Bee’s Knees, Last Word) we discovered here a decade ago. Even when every seat inside this narrow joint is taken (which is often), the only time it’s not perfectly low-key is during the lively, local trivia night—there’s real money on the line, after all. Otherwise, it’s basically a portal from Inman Square to Galway: Jigs and reels provide the background to a great meal, whether it’s a piping-hot bowl of beef stew, an Irish breakfast, or a cold pint served with a sláinte. What you’re drinking: It’s always a pleasant surprise to find Maine Beer Co. as the rotating tap. And if your team lost at trivia, you’ll at least get a round of consolation shots. Eastern Standard isn’t just one of the city’s finest bars—it’s the flagship bar of Boston. Regularly lauded as among the best in the country, it’s become almost a pointless, perfunctory exercise to include it on lists like this: You already know how great it is. But until this comfortably bustling, refined-but-casual French brasserie stops wowing us with impeccable service—whether it’s slinging drinks for an onslaught of Sox fans, late-night industry types, or hotel-hopping business travelers—we’ll still keep singing its praises. What you’re drinking: Bar maven Jackson Cannon’s Island Export, made with Pimm’s and Plantation rum. 528 Commonwealth Ave., Fenway/Kenmore, Boston, 617-532-9100, easternstandardboston.com. With her standing-room-only cocktail klatch in the Fenway, star chef Tiffani Faison makes smart of a modest footprint—and fills it with lots of personality. She allows her team to stretch its legs on the beverage front, plying the party with inventive cocktails and pours of funky fortified wines, and offers fancied-up finger foods—say, potato mille-feuille with caviar and lobster gravy—with a side of irreverence. (Peep the massive photo of Snoop Dogg and Martha Stewart, mid-embrace, that dominates the bathroom.) The seat-free approach makes the place feel like a neighborhood cocktail social, somewhere to swing by for an excellent drink and snack (or two) before moving on to the movies or another main event. Fool’s, to be frank, is kind of brilliant. What you’re drinking: We’re in love with the Fetishist, a marvelous ménage-a-trois between bourbon, Amaro, and spicy ginger. The upstairs bar at Grill 23 is exactly what a steakhouse bar should be. The veteran white-jacketed bartenders expertly toe the line of attentiveness—always there but never hovering. And there are endless bowls of spiced potato chips to snack on while sipping a well-stirred Old Fashioned or a pour from the next-level wine cellar. 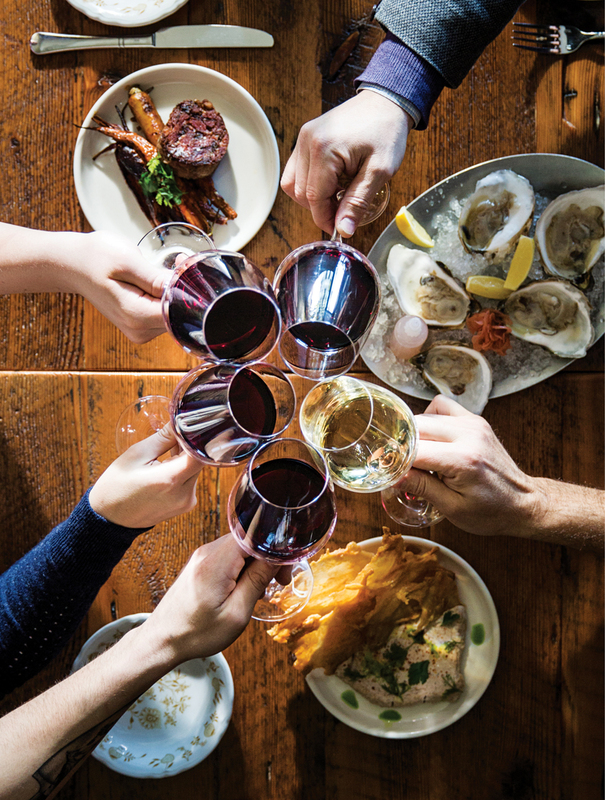 By-the-glass options favor French and American appellations, but if you’re feeling adventurous, let one of the restaurant’s somms guide your trip through the world-class 2,100-bottle list. What you’re drinking: Warm up on a cold night with a full-bodied Côtes du Rhône or Cali cab. Serious craft-cocktail bars aren’t necessarily synonymous with comfort (hello, low-backed stools and standing-room-only alcoves). But with its sophisticated living-room-inspired décor, plush couches, and pillowed armchairs, this bar nestled inside of the Hotel Commonwealth always makes us feel right at home. That’s all secondary, of course, to the top-level drink program overseen by Jackson Cannon and Jared Sadoian, whose oft-rotating menu tends to stick to the classics—or respectful riffs on them. What you’re drinking: A pro rendition of a tried-and-true libation like the Pegu Club, with gin, lime, curaçao, and bitters. 500A Commonwealth Ave., Fenway/Kenmore, Boston, 617-532-9150, thehawthornebar.com. The good vibes flow as easily as the pinot at this hip-hop-soundtracked wine bar, where customers pack like sardines into the ship-like space. Owner Haley Fortier has a knack for discovering quirky, small-production pours (such as a slightly salty sylvaner-Riesling blend from Alsace) and pairing them with imbiber-friendly snacks like cheese boards, toast, and tinned fish. While by-the-glass options are somewhat limited, they’ll open anything on the bottle list if you commit to buying two glasses. And, really, who stops at just one pour anyway? What you’re drinking: The second half of that bottle of biodynamic Viognier the couple next to you ordered off the bottle list. 45 Province St., Downtown Crossing, Boston, 617-208-6000, haleyhenry.com. When it opened, skeptics wondered whether Tim and Nancy Cushman, the owners of the high-end sushi spot O Ya, could pull off a rock-’n’-roll izakaya at Fenway’s Verb hotel. But a couple of years in, their niche concept is a smash hit. Balancing the playful and the serious, cheap cans of Orion and sake bombs share the rail with elaborate tiki-themed and Japanese-inspired cocktails—a mix that’s found favor with tourists and industry types alike. They’ve also proven that their appreciation for Boston’s storied rock history goes a lot deeper than the vintage-show-poster décor, regularly hosting live music and throwing parties with the organizers of the Boston Music Awards and the music blog Vanyaland, and launching the Groove record bar in spring 2019. What you’re drinking: A Mai Tai made with a deadly combo of rums, lime, curaçao, almond, and sesame. 1271 Boylston St., Fenway/Kenmore, Boston, 617-670-0507, hojokoboston.com. One of these days, it will be summer again. When that happens, follow our lead and head straight to Legal Harborside’s third-floor rooftop bar. That’s when the retractable ceiling lifts up to let in the salty air and clear blue sky. It’s when the panoramic harbor views commingle with live music from the Blue Hills Bank Pavilion next door. And it’s when people with all manner of drinking tastes can agree to meet up at the same bar—because not only are there pitchers of margs on the menu, there are also top-shelf-bourbon cocktails and more than 20 wines available by the glass. What you’re drinking: Start by sharing a pitcher of seasonally spiked sangria, and go from there. 270 Northern Ave., Liberty Wharf, Boston, 617-477-2900, legalseafoods.com. Housed above chef Michael Scelfo’s first Harvard Square hit, Longfellow fills two floors with an exciting array of cocktails—from low-proof session drinks to eclectic staff picks, to rotating tipples named for tracks that dominate the vinyl turntable downstairs. (The Springsteen-inspired Highway Patrolman, for instance, weaves notes of gin, sesame-lemonade, and passionfruit.) You can sip ’em on a small, seasonal roof deck or while noshing from Scelfo’s slate of (mostly) utensil-free foods: Crab Rangoon nachos and a pickled-cheddar-topped burger, served in addition to the now-iconic Alden original, are among the standouts. What you’re drinking: The State Trooper is an arresting combo of fermented clementine-infused brandy, clementine juice, Gran Classico and egg white. The cluster of crown-adorned tap handles from owner Daniel Lanigan’s Woburn brewery of the same name might catch your eye first. But this beer bar—which replaced the great B-Side Lounge in the late aughts—built its reputation with one of the best rotating selections in the Bay State, and it’s often among the first places to get new beers when breweries start distributing locally. The hefty food menu, meanwhile, is also full of uncommon gastropub fare, like an ever-changing belly special (pork, salmon, etc.) and Grana Padano-dusted polenta fries. What you’re drinking: A sessionable Hobo Life from the house brand, or the latest Artifact Cider on draft. 92 Hampshire St., Inman Square, Cambridge, 617-250-8454, lordhobo.com. It’s seen several name changes and renovations over the past century, but the Fairmont Copley Plaza’s bar has managed to retain its warm, stately ambience, complete with roaring fireplaces and sparkling chandeliers hanging from the original vaulted ceiling. 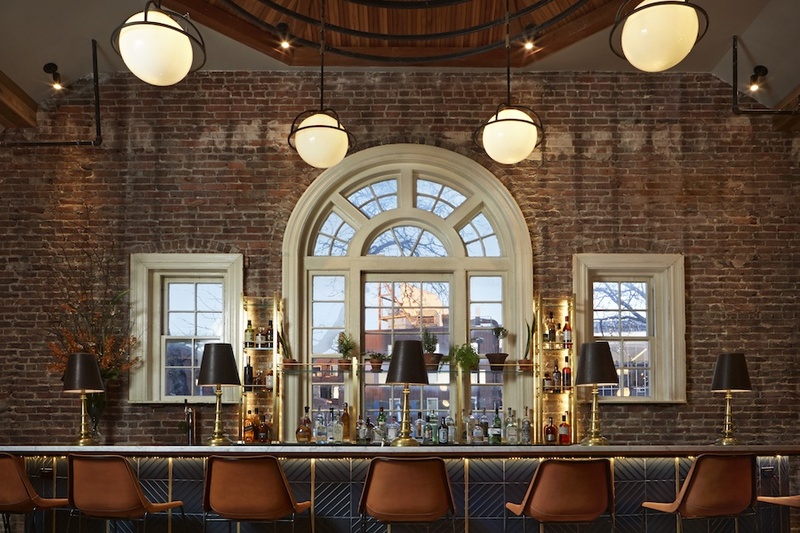 The drinks, meanwhile, match the cozy yet refined vibe—think generous pours of pinot, cocktails that are one or two twists away from old standbys (try the Matador, a less-sweet spin on a margarita), and Night Shift hefe on draft. What you’re drinking: A glass of 2006 Dom Pérignon. Because there’s always something to celebrate. 138 St. James Ave., Copley Square, Boston, 617-585-7222, oaklongbarkitchen.com. It’s no accident that Parlor slings the finest cocktails and has the best-curated beer menu of any explicitly sports-themed bar in the city. The laid-back classiness—the vibe might be best described as “artisanal bro”—has everything to do with the ownership it shares with its equally hip neighbor, Trina’s Starlite Lounge. Thanks to the cozy space’s impressive number of flat-screens, you’ll never miss a game. Trust us, watch basketball here. What you’re drinking: A pitcher of Maine-brewed Rising Tide Zephyr IPA goes down well whether the C’s are winning or not. 3 Beacon St., Inman Square, Somerville, 617-576-0231, parlorsportsbar.com. You won’t see shots or pitchers here—the watchful La Chouffe gnome perched above the back bar would frown on such an order anyway. This Washington Square stalwart is the place to find rare Belgian imports, and it has been for the past 15 years. But it also serves as a go-to source for Trillium, Allagash, and other New England favorites—and thanks to owner David Ciccolo’s peerless reputation and professional relationships, it’s the only place in Greater Boston where we’ve spotted true white whales, rare trophy brews known to surface on special occasions. What you’re drinking: Start with a classic Belgian saison and compare it with a nouveau New England farmhouse ale on your second round. 1648 Beacon St., Washington Square, Brookline, 617-277-2880, thepublickhousebeerbar.com. Taking stock of the dining room’s neon beer signs, analog jukebox, and taxidermy-bedecked walls, a recent visitor to State Park deftly observed, “This place is like a Disney version of a dive bar.” In fact, this kitschily outfitted Kendall Square spot is meant to evoke the kind of backwoods establishment you’d find outside Virginia’s Hungry Mother State Park, with rustic fare to match: Think pickled eggs, pork-chop sandwiches, and a tongue-blistering Nashville hot chicken platter. Come for the cocktail pitchers; stay for the late-night shuffleboard. What you’re drinking: The Green Walnut, a seductive tipple of rye, Amaro Meletti, and the walnut liqueur Nux Alpina. One Kendall Square, Building 300 (Lower Level), Cambridge, 617-848-4355, statepark.is. Sherry flights. Sherry food pairings. Sherry mixed into giant G & Ts. More than 15 manzanillas, finos, and olorosos available by the glass, plus dozens more on the bottle list. Owner-sommelier Deborah Hansen’s devotion to the under-appreciated fortified wine knows no limits—and it’s always a joy to tag along with her on a jaunt through Jerez. Not a fan? The bar, nestled inside of her Brookline tapas spot, Taberna de Haro, is also well stocked with Spain’s other top tipples: high-quality gins and a Rioja-heavy wine list. What you’re drinking: The flight of four sherries offers a deep dive into manzanillas—and is delivered to your seat with free croquetas de jamón. 999 Beacon St., Brookline, 617-277-8272, tabernaboston.com. The spirit of a dive bar, to paraphrase Thomas Jefferson, must be refreshed from time to time with the blood of students. Or the beer money of students, anyway. That’s what’s kept this Theater District classic—a redoubt amid the rapidly changing neighborhood—alive for decades, though it came under new ownership in 2018. (The Greater Boston Bar Co. plans to change nothing—just the way we want it.) Every night, Emerson undergrads flock to the Tam for its cheap beer, shots, and grungy aesthetic, despite (or maybe because of) the fact that most of the beer mirrors on the wall are older than they are. What you’re drinking: A (very) cheap bottle of domestic. 222 Tremont St., Boston, 617-482-9182. It’s not the low lights, the vintage ads plastered on the walls, or the sound of the Pixies’ “Debaser” splashing out into the lounge. It’s not the snarky messages spelled out in alphabet magnets on the antique fridge. It’s not even the spot-on cocktails, like the deconstructed rum and Coke with house-made cola bitters. The best measure of what makes Trina’s special is its drinkers: the Camberville eccentrics, postgrads, and industry types who show up to blow off steam over sangria and bloody Marys. Spend an evening hoisting pints with the regulars, and you’re well on your way to becoming one yourself. What you’re drinking: The STAR-POP, a signature carbonated cocktail from a rotating selection crafted by bartender Isaac Sussman. 3 Beacon St., Inman Square, Somerville, 617-576-0006, trinasstarlitelounge.com. Frequented by aides, scribes, and legislators alike, this ancient haunt of Beacon Hill is the political class’s go-to spot for drowning sorrows, toasting victory, or plotting revenge. Decades of traffic have worn it in like a comfortable antique armchair, and while hardly a dive, the place prides itself on its lack of frills—just the way its regulars like it. And thanks to its proximity to the Golden Dome, there’s perhaps nowhere else in Boston better for eavesdropping over a pint or three. If walls could talk, the 21st would have the goods on all of you. What you’re drinking: Keep it simple (and blue-blazer-classy) with a well-mixed Manhattan. 150 Bowdoin St., Beacon Hill, Boston, 617-227-7100, 21stboston.com. You’d be hard-pressed to find a more glamorous setting to clink coupes in than this lounge-y restaurant. The face-lifted 19th-century space—once home to the legendary Locke-Ober—is awash in crystal chandeliers, moody lighting, and pretty people. 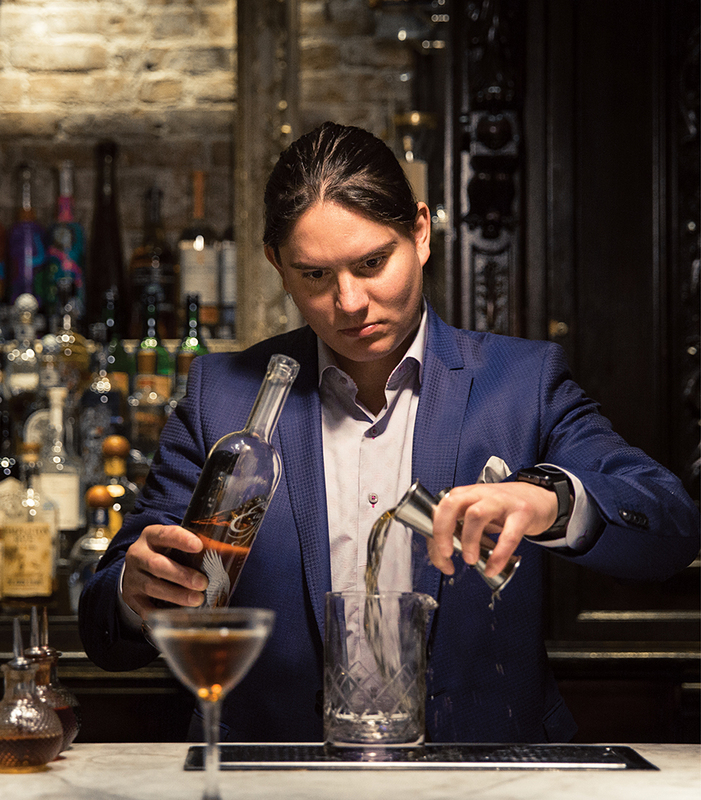 But despite the theatrics, it’s not all smoke and mirrors: Thanks to beverage director and general manager Nicole Lebedevitch, there’s some legit mixology—such as the Rubicon, a flaming gin-Chartreuse concoction—happening behind the bar. What you’re drinking: Clink straws over large-format cocktails like (ironically named) Lil’ Sebastian: spicy tequila spiked with citrus juices and Whaler’s APA.